After their success in their initial season in 1915, the Class D, Blue Ridge League went through some growing pains in their second season. Despite the turmoil of war, looming greater over in Europe, which was beginning to take a toll on the minor leagues throughout the country, the fans of the Blue Ridge League towns continued to support their hometown teams with earnest. Several of the league clubs decided to change their nicknames prior to the second season. Frederick, which captured the first Blue Ridge League pennant the year before, decided to change their name to Champs, taking the moniker away from Martinsburg, who had won the 1914 Tri-City League title. The West Virginia panhandle club selected Mountaineers as their nickname. Hagerstown, which didn't like the name Blues, changed their nickname to Terriers, after a fan vote. Gettysburg changed from Patriots to Ponies, while Hanover went from Hornets to Raiders. The league was beginning to take shape, but it still had a few flaws to work out. Blue Ridge League President Charles Boyer, who also had served previously as league president in both the South Atlantic and Virginia State Leagues, was taking some heat from some of his fellow counterparts, because of a conflict of interest, since he still owned the Hagerstown club at the same time. It was felt by some members that the league umpires that Boyer had hired, were showing some favoritism towards Boyer's club, especially when they played at Willow Lane Park, Boyer's home field. Unfortunately, the issue became very heated among some the newspapers that were reporting on the league. Led by the Chambersburg's Repository and The Public Opinion, their criticism's ultimately resulted in Boyer's resignation as league president on May 14, after both his honesty and integrity were questioned, as well as an umpire named Wisner, who quit the day before. The remaining league Board of Directors voted on Boyer's replacement, but each club selected a person associated with each of the affiliate league clubs. After more discussion, Martinsburg Max von Schlegel and Frederick's Frank K. Schmidt recommended James Vincent Jamison, Jr.. Jamison, a well known Hagerstown businessman, was known for his unbiased attitude and integrity, and all of the league clubs voted unanimously to elect Jamison as the new President of the Blue Ridge League, after just one full week into the 1916 season. Jamison had his work cut out for him. The league was in some disarray, and even though the board of directors decided to raise each club's monthly salary cap from $800 to $1,100 per month, their was still some concern over the honesty of some of the individual club's ethics. Though the league as a whole was financially secure, some of the smaller towns, especially Gettysburg, were still struggling. The Ponies played their games at Nixon Field on the campus of Gettysburg College, which had no grandstand or fence, and could not charge ticket admissions since they had nothing to control the flow of fans coming to their games. The umpire situation became a challenge for Jamison during the early part of his administration, as it seemed some of the clubs and their newspapers were still voicing their opinions over the favoritism some of the umpires were showing against the clubs. Some of the clubs, especially the teams from Pennsylvania were the most vocal, both on and off the field. Hanover Manager Billy Starr, who was notorious for his "crabbing" and of protesting games, had a game forfeited against his club in Chambersburg on August 22. A controversial double play call by Umpire Marks sparked vocal protests by several Raider players, because they felt the umpire was being unfair by siding with the Maroons. After "crabbing" with Marks, the umpire tossed out several Hanover players, and had Starr chased from the field by a policeman, before announcing to the crowd that the game was forfeited to Chambersburg, 9-0. Due to the war effort overseas, the league had trouble finding good umpires, as some joined the service, or were promoted to other existing leagues. Jamison did eventually bring back some of his umpiring crew from the year before, including veteran umps Levi Glatts and "Doll Derr", to help ease the situation. Both Glatts and Derr were umpiring in the New York State League, which had disbanded. Once in office, Jamison did impose a limitation on the type of players who coming into the league, disallowing any new incoming players with Major League experience, and limiting each club to just two players who played on the Class B or C levels. Unfortunately, though the idea was a good one, there were loopholes that some of the clubs and players took advantage of. Since there were limited resources to verify player's status, it was not uncommon for them to play under an alias, since the only way to check was by their playing name. Two known examples were Wick Winslow and Kenny Thompson. Winslow, a veteran Class B pitcher whose real name was Walter P. Warwick, had to change his playing name to be eligible to play for Hagerstown, since they already reached the league's player level limit on their roster. Warwick's alias was penned by his manager, Bert Weeden, in a post office in Brockton, MA as they were leaving to go to Hagerstown for the start of the season. Weeden noticed a sign outside the post office that read "Mrs. Winslow's Soothing Cough Syrup," and tagged the name to Warwick,, adding his nickname "Wick", to change it to "Wick Winslow." Ironically, Winslow tossed a no-hitter for Hagerstown, then was released mid-season, before finishing up the last month of the season with the Frederick club. The following season, 1917, Winslow became the only Frederick pitcher to win 20-games in one season, when he accounted for 21 of the Hustlers 44 wins. Thompson, whose real name was Kenneth Knode, played under an alias with Martinsburg in the Blue Ridge League, in order to keep his college eligibility. A second baseman, it was widely known by the local newspapers that Thompson was in reality Knode, but since he played for a college in the midwest, he still he kept his college eligibity, since he must of kept his alias a secret during that time. At that time, Knode also was the team captain of the University of Michigan football eleven. The Chambersburg Maroons brought in a new manager in Eddie Hooper. Hooper was the head baseball coach at Johns Hopkins University, and would bring in a competitive team into the league. The Maroons club president, named Kottcamp, worked out a deal with Jack Dunn's Baltimore Orioles, who had returned to the International League, after the demise of the Federal League during the off-season. Two pitchers, Herb Thormahlen and Al Ehmling, and a catcher named Alex Schaufele joined the Maroons, along with a former Federal League player, first baseman Karl Kolseth, and outfielder James "Bugs" Snyder to combine for one of the strongest overall teams in the league in 1916. The end result would see Chambersburg take the league crown that year, with Hooper edging Frederick's Clyde Barnhart for the league batting title (.330). Chambersburg pennant did not come easy, as the "Country" Morris led Martinsburg Mountaineers battled with the Maroons for first place throughout the season. Despite finishing the season with more wins that another Blue Ridge League team, Martinsburg had to settle for second for the second straight season, this time by just one-tenth of a percentage point. The rivalry between the two clubs became very heated in August, especially after the two teams had tied three games, including one in Martinsburg, and the Chambersburg directors refused to play in West Virginia city. President Jamison sternly informed the Chambersburg club that they had to play one of the games in Martinsburg, or lose their $400 forfeit money put up by each club at the beginning of the season. The Maroons complied. The Mountaineers were led by pitching sensation Marvin Goodwin of Gordonsville, VA, who led the league with 19 wins and 165 strikeouts, while Frank Colley accounted for 17 victories. Alan "Lefty" Clarke added 14 wins and 126 strikeouts for the "Eers, as Martinsburg's Big Three accounted for 50 of their 56 victories. George "Reggie" Rawlings was the top fielding outfielder in the league, as well of one of the better hitters. The 'Eers infield of Short Long, Johnny Bates, Katsey Dean, and a 19-year old first baseman named Luzerne Blue also helped contribute to the "Eers pennant drive. Hagerstown, under new manager Bert Weeden, kept the Terriers in the race most of the season, falling five games back on the last day of the season. First baseman Jack Hurley, and outfielder Charley Dysert were mainstays in the Hagerstown battery, while "Chalkey" McCleary had the best winning percentage in the league (.667), winning 18, and losing only eight game. Other players who made their mark during the season included Hanover's Willie Scherdel. The 19-year old from McSherrystown, PA, led the Raiders with a record of 14-9, striking out 144 batters before being sold to the Milwaukee Brewers of the American Association with three weeks left in the season. Frederick's Bobbie Orrison, the league's top hitter in 1915, continued to hammer opposing pitching, tying with teammate Clyde Barnhart for the lead league in home runs with nine. 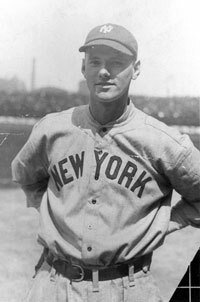 Along with Tex Myers, the Champs had three of the top four hitters in the league, but did not enjoy the winning success they had the year before as the Hustlers. Gettysburg catcher Art Kohler of Sibleyville, IL had the eye of several Major League scouts, because of his strong arm and bat, and his contract was eventually sold to the Detroit Tigers. The Baltimore Orioles played an pre-season exhibition against Frederick at Agricultural Park, with the Champs winning the game, 6-5. Former Frederick player, Bill Lamar, played centerfield for the Orioles, while Dunn's son, Jack, Jr., played centerfield for Frederick. The younger Dunn played briefly for Frederick, before being released a month into the season. 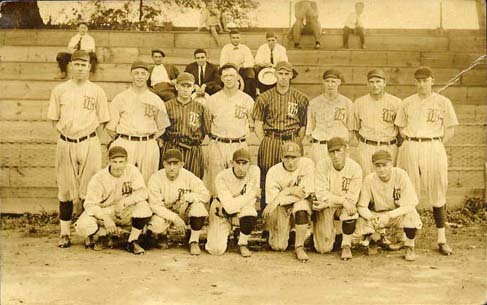 From left to right: (bottom row) Les Bangs; Bill Phoenix; Monk Walter; John Doherty; Bill Dempsey; Walter "Polly" Speraw; (top row) Jack Hurley; Charley Dysert; Joe Benson; Bert Weeden, Manager; Earl N. Howard; Joe Benson; Wick Winslow; Chalkey McCleary. Photo credits - Dan Yaw of Tampa, FL/www.vintageball.com. Picture reproduced in Hagerstown Morning Herald on January 12, 1956. On August 15, former league president Charles Boyer sold his stake in Hagerstown's minor league baseball team to a Stock Company headed by Colonel J. C. Roulette, and dissolved his financial interest in the Blue Ridge League completely. As the season progressed, the war in Europe raged on, causing some concern among the Blue Ridge League cities. Fan interest started to wane late in the summer, compared to the year before, as other more important issues started to take the attention of the baseball fans those communities. A country wide service draft was looming in the distance, and some noted baseball players began exchanging their bats and balls for guns and bullets by enlisting in the armed services. The Blue Ridge League, itself, was indirectly affected by the "bigger picture of war" that was slowly drawing the country into its clutches. Fortunately, the game of baseball became an outlet for many fans who wanted escape for a few hours from the realities that surrounded them. Despite the growing pains, the Class D, Blue Ridge League continued to be an overall success in their second year. They were one of a few of the lower level leagues that were thriving amidst the financial turmoil that many of the minor leagues were facing at the time.